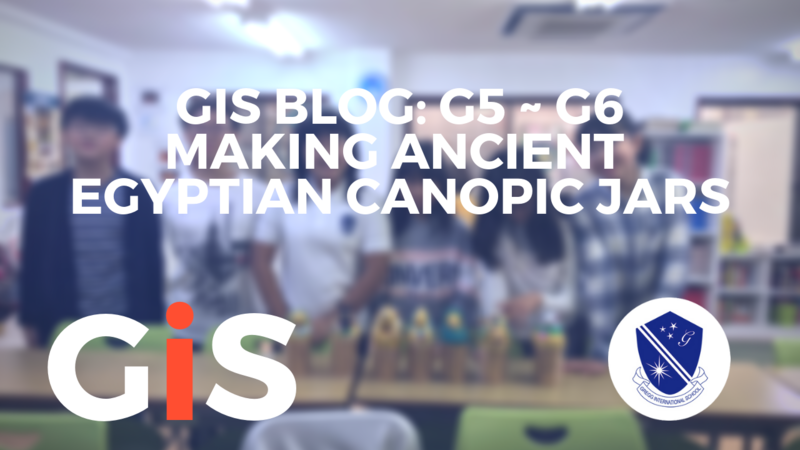 As part of our studies of Ancient Egypt, grade 5+6 learned about canopic jars. Canopic jars were used in the Egyptian mummification process to protect the dead person’s human organs. There were four jars to hold a different organ; the stomach, intestines, lungs, and liver. It was believed that these organs would be needed in the afterlife. Each jar was protected by a different god. For our canopic jar art project, the students first made a base model using large plastic cups, cardboard and clay and painted the base. The students then sculpted their chosen canopic jar figure using paper clay and sculpting tools. After perfecting the shape and allowing to dry, the students then painted the top of the jars in gold paint. The next step was to paint in the details on the canopic jar clay sculpture. The students each wrote their name along with their chosen canopic jar god’s name in hieroglyphs to place on the front of the jar. Finally the students added some gold décor to finish their jars. Here you can see the students standing proudly with their finished pieces!